A Florida man was killed on Friday by what ornithologists say is the “world’s most dangerous bird.” It was a penguin — an enormous, flightless bird around which even experienced zookeepers take precautions. May pigmeat rest in peace! Wow - people killed by Penguins. Waddle they think of next?! Nonsense! I'm in Fiji enjoy my honeymoon with the Twins. MacKenzie and her Uncle B.Young V-8 are pretty upset with a fella who jilted her and her twin cousin after a long courtship before I stepped in. They have the money and connections, hmm..? I'll call Porkchop to see if he's noticed any giant birds wandering around Shady Acres? He's fairly reliable as long as it's not mushroom season. Then he sees things that aren't there, sort of like... well... my pal Al does. That's why Al had him bumped up to head of security for the geezer-plex. Those folks are lucky to have Porkchop watching over them. However residents should refrain from wearing feathered hats after the rainy and mushroom season comes. He's loaded for avian mayhem from May 1st on. He has a tendency to shoot first and walk away, muttering, "Another flock down, many more to go." "I always wanted a pet.... that could kill me!" Hmmm....most news reports say it was a Cassowary, but I figure if Penguins can strike such fear and loathing into the legendary Al Fansome, then I guess it doesn't make any difference! They have those at the Denver Zoo. I know because I used to always be somewhat disappointed that they weren't emus, though when you first see them in their enclosure that's exactly what they look like. Lots of penguins at the Denver Zoo too. Fansome beware. Row upon row of hideous bird teeth! Years ago after we came home from church one Sunday happened to look out the back window and saw the next door neighbors. One on a horse and one in the back of a pickup truck with his dad driving, they were chasing an ostrich around their field. By the time I got the wife to the window they had captured it. Nonsense! They're there in front of your eyes, plain as day. 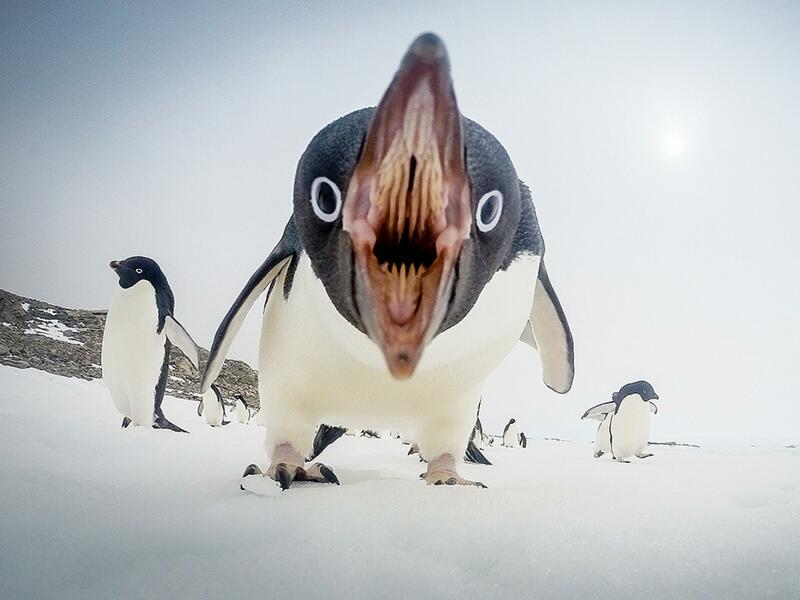 No one denies penguins have teeth, the question is whether they can harm humans? Obviously teeth that size wouldn't harm a baby. Those are the famous Tattoo Penguins. The people of New Zealand trained them to apply tattoo's. The Maori domesticated them shortly after arriving on the islands. You should be careful with that picture; you'll put somebody's eye out!! !